Naturally smoked bacon, cured with sea salt, and thick sliced for good old-fashioned flavor. 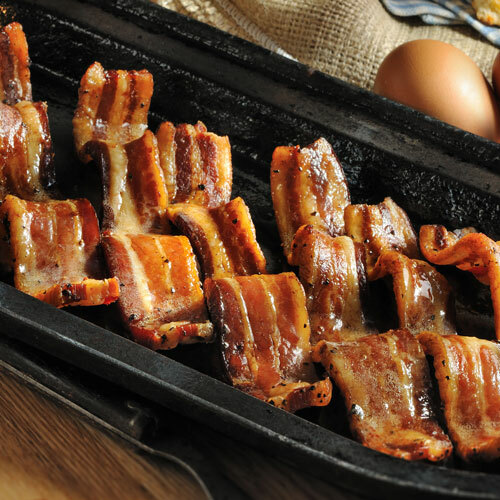 Whether for breakfast, lunch or dinner - the heavenly aroma and savory taste of our Cherrywood and Applewood Smoked Bacons will delight your senses and your taste-buds. two of each. Four 24 oz. packages. Serves about 36. Serv. Size: 1 Pan Fried Slice(14g), Amount Per Serving: Calories 70, Fat Cal. 50, Total Fat 5g (8% DV), Sat. Fat 2g (10% DV) Trans Fat 0g, Cholesterol 10mg (4% DV), Sodium 240mg (10% DV), Total Carb. 0g (0% DV), Dietary Fiber 0g (0%DV), Sugars 0g, Protein 4g, Vitamin A (0% DV), Vitamin C (0% DV), Calcium (0% DV), Iron (0% DV). Percent Daily Values (DV) are based on a 2,000 calorie diet. My sister in law is visiting my mom, who I order for, and in this case , bacon. She said "I don't know where you got that bacon from, but I ate so many slices, I'm ashamed. It was Smithfield's. I'll send her some for the holidays.